The tendency to hold and pursue excessively high standards for oneself and for others can interfere with academic achievement. Counsellors who work in university settings are often presented with students whose capabilities do not reflect their levels of achievement. This study reports on the evaluation of an eight-week group intervention designed to help university students shift from negative and often debilitating perfectionism to positive and enhancing perfectionism. The group treatment focused on changing attitudes, beliefs, feelings, and interpersonal interactions affected by perfectionism using combined cognitive-behavioral and interpersonal approaches. Standardized measures, including the Beck Depression Inventory (Beck et al., BDI-II manual. San Antonio: The Psychological Corporation, 1996), the Beck Anxiety Inventory (Beck and Steer, Beck Anxiety Inventory: Manual. 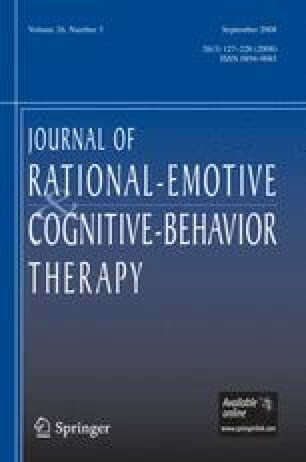 San Antonio: The Psychological Corporation, 1993), and the Multidimensional Perfectionism Scale (Hewitt and Flett, Journal of Personality & Social Psychology, 60, 456–470, 1991a), provided data for pre- and post analysis of a treatment group (n = 30), and comparison groups of students attending group programs on career planning (n = 30) and attending psychology classes (n = 30). Results show that students participating in the treatment group significantly reduced their levels of depression, anxiety, and perfectionism in comparison to students who did not attend the treatment program. Implications of the findings suggest the importance of considering perfectionism on a continuum of negative and positive influences while helping students to address the intrapersonal and interpersonal dimensions of perfectionism.